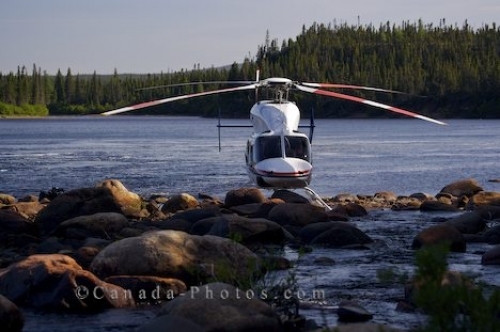 A helicopter waits on the rocks of the banks of the White Bear River Falls for its passengers that are staying at the Rifflin'Hitch Lodge in Southern Labrador before taking flight. Fishing around the rivers in Southern Labrador is excellent and a helicopter can take you to some fascinating fishing places or on a flight just to enjoy the landscape. Helicopter on the banks of the river at White Bear River Falls to collect guests of Rifflin'Hitch Lodge in Southern Labrador, Labrador, Newfoundland Labrador, Canada. Picture of a helicopter on White Bear River picking up passengers from Rifflin'Hitch Lodge for a flight in Southern Labrador.